Heart bypass surgery creates a new route, called a bypass, for blood and oxygen to reach your heart. 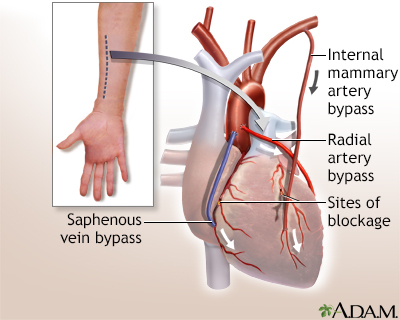 Minimally invasive coronary (heart) artery bypass can be done without stopping the heart. 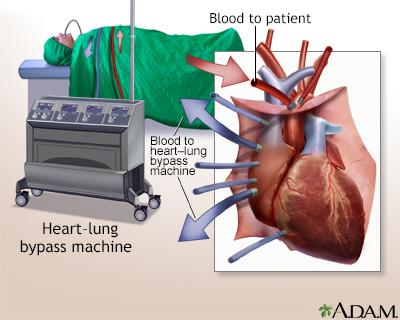 Therefore, you do not need to be put on a heart-lung machine for this procedure. The heart surgeon will make a 3- to 5-inch (8 to 13 centimeters) surgical cut in the left part of your chest between your ribs to reach your heart. Muscles in the area will be pushed apart. A small part of the front of the rib, called the costal cartilage, will be removed. The surgeon will then find and prepare an artery on your chest wall (internal mammary artery) to attach to your coronary artery that is blocked. Next, the surgeon will use sutures to connect the prepared chest artery to the coronary artery that is blocked. You will not be on a heart-lung machine for this surgery. However, you will have general anesthesia so you will be asleep and not feel pain. A device will be attached to your heart to stabilize it. You will also receive medicine to slow the heart down. You may have a tube in your chest for drainage of fluid. This will be removed in a day or two. Your doctor may recommend a minimally invasive coronary artery bypass if you have a blockage in one or two coronary arteries, most often in the front of the heart. 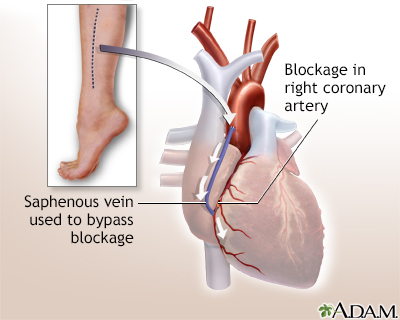 When one or more of the coronary arteries become partly or totally blocked, your heart does not get enough blood. 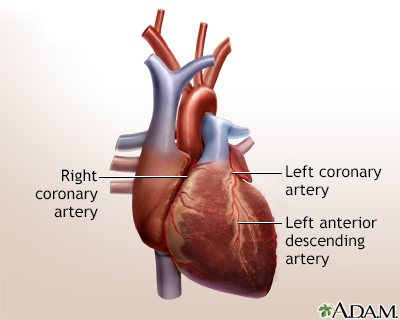 This is called ischemic heart disease or coronary artery disease. It can cause chest pain (angina). Your doctor may have first tried to treat you with medicines. You may have also tried cardiac rehabilitation or other treatments, such as angioplasty with stenting. 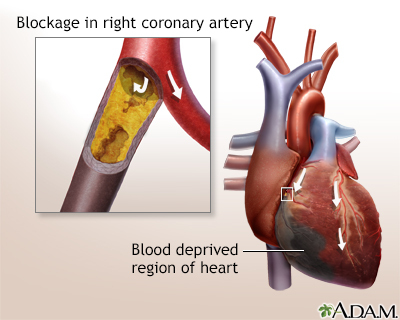 Coronary artery disease varies from person to person. Heart bypass surgery is just one type of treatment. It is not right for everyone. Your doctor will talk to you about the risks of surgery. In general, the complications of minimally invasive coronary artery bypass are lower than with open coronary artery bypass surgery. Memory loss, loss of mental clarity, or "fuzzy thinking." This is less common in people who have minimally invasive coronary artery bypass than in people who have open coronary bypass. A chest wound infection. This is more likely to happen if you are obese, have diabetes, or have had coronary bypass surgery in the past. Low-grade fever and chest pain (together called postpericardiotomy syndrome), which can last up to 6 months. Pain at the site of the cut. Possible need to convert to conventional procedure with bypass machine during surgery. Always tell your doctor what drugs you are taking, even drugs or herbs you bought without a prescription. For the 2-week period before surgery, you may be asked to stop taking drugs that make it harder for your blood to clot. These might cause increased bleeding during the surgery. They include aspirin, ibuprofen (such as Advil and Motrin), naproxen (such as Aleve and Naprosyn), and other similar drugs. If you are taking clopidogrel (Plavix), ask your surgeon when you should stop taking it before surgery. 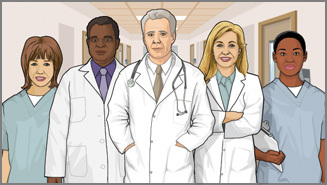 Contact your doctor if you have a cold, flu, fever, herpes breakout, or any other illness. You will most often be asked not to drink or eat anything after midnight the night before your surgery. This includes chewing gum and using breath mints. Rinse your mouth with water if it feels dry, but be careful not to swallow. Your doctor will tell you when to arrive at the hospital. You may be able to leave the hospital 2 or 3 days after your surgery. The doctor or nurse will tell you how to care for yourself at home. You may be able to return to normal activities after 2 or 3 weeks. Recovery from surgery takes time, and you may not see the full benefits of your surgery for 3 to 6 months. 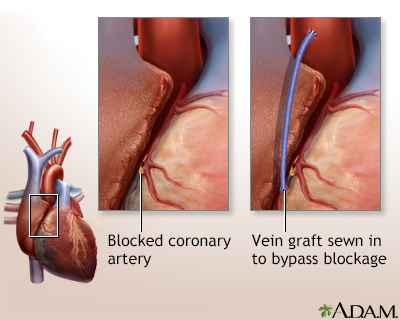 In most people who have heart bypass surgery, the grafts remain open and work well for many years. Treat high blood pressure, high blood sugar (if you have diabetes), and high cholesterol. You may be more likely to have problems with your blood vessels if you have kidney disease or other medical problems. Mick S, Keshavamurthy S, Mihaljevic T, Bonatti J. Robotic and alternative approaches to coronary artery bypass grafting. In: Sellke FW, del Nido PJ, Swanson SJ, eds. Sabiston and Spencer Surgery of the Chest. 9th ed. Philadelphia, PA: Elsevier; 2016:chap 90. Rodriguez ML, Ruel M. Minimally invasive coronary artery bypass grafting. In: Selike FW, Ruel M, eds. Atlas of Cardiac Surgical Techniques. 2nd ed. Philadelphia, PA: Elsevier; 2019:chap 5.